“We’ve decided to stop development on our self-driving truck program and move forward exclusively with cars,” said Eric Meyhofer, head of Uber Advanced Technologies Group. Employees focused on self-driving trucks will shift to other work that supports Uber’s ongoing development of self-driving technology. If a comparable role isn’t available, Uber will offer them a relocation or separation package, according to the San Francisco-based company. “We recently took the important step of returning [self-driving cars with an operator but no passengers] to public roads in Pittsburgh, and as we look to continue that momentum, we believe having our entire team’s energy and expertise focused on this effort is the best path forward,” Meyhofer said. Uber’s self-driving cars were back in Pittsburgh in July, four months after one of its self-driving SUVs with a driver behind the wheel but operating in computer-control mode hit and killed a woman walking a bicycle across a road at night in Tempe, Ariz.
Uber parked all its self-driving cars operating in Pittsburgh, San Francisco, Tempe and Toronto after the accident. In a statement July 31, Uber said it intends to continue its in-house development of lidar technology that is central to the self-driving approach, referring to scalable lidar technology as an important investment that it will continue to make. One expert said Uber can perfect what it’s doing in the car world and come back to trucks when it wants to. He suggested even with Uber’s withdrawal, the field of self-driving commercial vehicles remains healthy and just as viable as before Uber’s announcement. Google’s Waymo, plus Embark, Starsky Robotics and TuSimple still are involved and, in some cases, already delivering freight on a limited scale. “They are cranking along,” Bishop said. Another industry observer said the more companies working on a technology, the better. “If there’s one company, they don’t have the challenge and competition, so it takes longer. 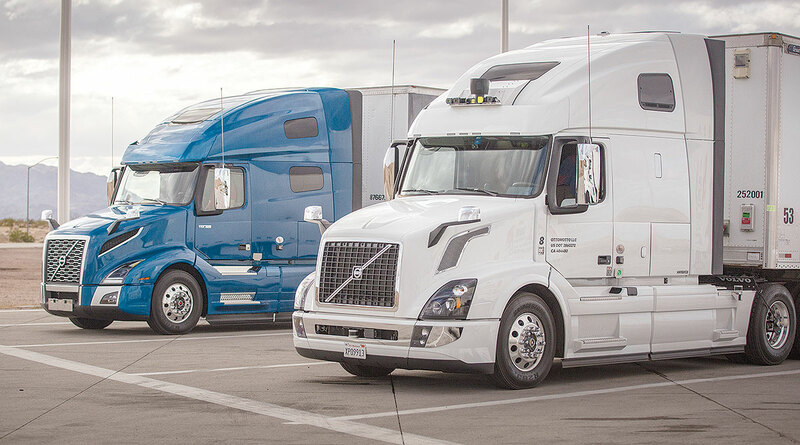 But on the other hand, working on something as new and dramatic as self-driving trucks is tough and takes a lot of resources and time,” said Mike Roeth, executive director for the North American Council for Freight Efficiency. Meanwhile, the National Transportation Safety Board is investigating the fatal accident in Tempe and reported Uber’s self-driving system first registered radar and lidar observations of the pedestrian about 6 seconds before impact, when the vehicle was traveling at 43 mph. At 1.3 seconds before impact, the self-driving system determined that an emergency braking maneuver was needed to mitigate a collision, NHTSA found. “According to Uber, emergency braking maneuvers are not enabled while the vehicle is under computer control, to reduce the potential for erratic vehicle behavior. The vehicle operator is relied on to intervene and take action. The system is not designed to alert the operator,” NHTSA said in its preliminary report. “The self-driving system data showed that the vehicle operator intervened less than a second before impact by engaging the steering wheel. The vehicle speed at impact was 39 mph. The operator began braking less than a second after the impact. The data also showed that all aspects of the self-driving system were operating normally at the time of the crash and that there were no faults or diagnostic messages,” the report continued. Uber got into self-driving commercial vehicle development through its acquisition of startup Otto in August 2016. Then in October, an Otto truck carrying 51,744 cans of Budweiser completed an autonomous truckload shipment from Anheuser-Busch’s Fort Collins, Colo., brewery to a wholly owned distributorship in Colorado Springs, a distance of 132 miles. It marked the first commercial beer delivery using autonomous driving technology. In related Uber news, the company indicated it did not need to immediately develop self-driving trucks to remain competitive in the freight logistics area. Since Uber Freight was launched in May 2017, coverage available on the mobile app for load matching has grown from limited operations in three primary regions to the entire continental United States, and load volume is doubling every quarter, according to the company. Intended for owner-operators and small fleets, the app helps them book loads with one tap on their smartphones and offers up-front pricing and quick payment.